This article is about associating a scalar value with every point in a space. For the set whose members are scalars, see field. 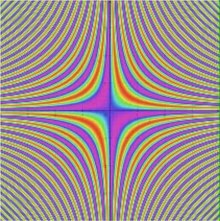 A scalar field such as temperature or pressure, where intensity of the field is represented by different hues of color. In mathematics and physics, a scalar field associates a scalar value to every point in a space – possibly physical space. The scalar may either be a (dimensionless) mathematical number or a physical quantity. In a physical context, scalar fields are required to be independent of the choice of reference frame, meaning that any two observers using the same units will agree on the value of the scalar field at the same absolute point in space (or spacetime) regardless of their respective points of origin. Examples used in physics include the temperature distribution throughout space, the pressure distribution in a fluid, and spin-zero quantum fields, such as the Higgs field. These fields are the subject of scalar field theory. increases. Red represents positive values, purple represents negative values, and sky blue represents values close to zero. In quantum field theory, a scalar field is associated with spin-0 particles. The scalar field may be real or complex valued. Complex scalar fields represent charged particles. These include the charged Higgs field of the Standard Model, as well as the charged pions mediating the strong nuclear interaction. In the Standard Model of elementary particles, a scalar Higgs field is used to give the leptons and massive vector bosons their mass, via a combination of the Yukawa interaction and the spontaneous symmetry breaking. This mechanism is known as the Higgs mechanism. A candidate for the Higgs boson was first detected at CERN in 2012.
scalar-tensor theories represent the gravitational interaction through both a tensor and a scalar. Such attempts are for example the Jordan theory as a generalization of the Kaluza–Klein theory and the Brans–Dicke theory. Scalar fields like the Higgs field can be found within scalar-tensor theories, using as scalar field the Higgs field of the Standard Model. This field interacts gravitationally and Yukawa-like (short-ranged) with the particles that get mass through it. Scalar fields are found within superstring theories as dilaton fields, breaking the conformal symmetry of the string, though balancing the quantum anomalies of this tensor. Scalar fields are supposed to cause the accelerated expansion of the universe (inflation), helping to solve the horizon problem and giving a hypothetical reason for the non-vanishing cosmological constant of cosmology. Massless (i.e. long-ranged) scalar fields in this context are known as inflatons. Massive (i.e. short-ranged) scalar fields are proposed, too, using for example Higgs-like fields. Vector fields, which associate a vector to every point in space. Some examples of vector fields include the electromagnetic field and the Newtonian gravitational field. Tensor fields, which associate a tensor to every point in space. For example, in general relativity gravitation is associated with the tensor field called Einstein tensor. In Kaluza–Klein theory, spacetime is extended to five dimensions and its Riemann curvature tensor can be separated out into ordinary four-dimensional gravitation plus an extra set, which is equivalent to Maxwell's equations for the electromagnetic field, plus an extra scalar field known as the "dilaton". The dilaton scalar is also found among the massless bosonic fields in string theory. ^ Apostol, Tom (1969). Calculus. II (2nd ed.). Wiley. ^ Technically, pions are actually examples of pseudoscalar mesons, which fail to be invariant under spatial inversion, but are otherwise invariant under Lorentz transformations. ^ P.W. Higgs (Oct 1964). "Broken Symmetries and the Masses of Gauge Bosons". Phys. Rev. Lett. 13 (16): 508. Bibcode:1964PhRvL..13..508H. doi:10.1103/PhysRevLett.13.508. ^ Jordan, P. (1955). Schwerkraft und Weltall. Braunschweig: Vieweg. ^ Brans, C.; Dicke, R. (1961). "Mach's Principle and a Relativistic Theory of Gravitation". Phys. Rev. 124 (3): 925. Bibcode:1961PhRv..124..925B. doi:10.1103/PhysRev.124.925. ^ Zee, A. (1979). "Broken-Symmetric Theory of Gravity". Phys. Rev. Lett. 42 (7): 417. Bibcode:1979PhRvL..42..417Z. doi:10.1103/PhysRevLett.42.417. ^ Dehnen, H.; Frommert, H.; Ghaboussi, F. (1992). "Higgs field and a new scalar-tensor theory of gravity". Int. J. Theor. Phys. 31 (1): 109. Bibcode:1992IJTP...31..109D. doi:10.1007/BF00674344. ^ Dehnen, H.; Frommmert, H. (1991). "Higgs-field gravity within the standard model". Int. J. Theor. Phys. 30 (7): 985–998 [p. 987]. Bibcode:1991IJTP...30..985D. doi:10.1007/BF00673991. ^ Brans, C. H. (2005). "The Roots of scalar-tensor theory". arXiv:gr-qc/0506063. Bibcode:2005gr.qc.....6063B. ^ Guth, A. (1981). "Inflationary universe: A possible solution to the horizon and flatness problems". Phys. Rev. D. 23: 347. Bibcode:1981PhRvD..23..347G. doi:10.1103/PhysRevD.23.347. ^ Cervantes-Cota, J. L.; Dehnen, H. (1995). "Induced gravity inflation in the SU(5) GUT". Phys. Rev. D. 51: 395. arXiv:astro-ph/9412032. Bibcode:1995PhRvD..51..395C. doi:10.1103/PhysRevD.51.395.